The city is once again seeking bids for a vacant lot in Shaw once occupied by protesters demanding subsidized housing, this time DC leaders hope its prominent Rhode Island Avenue address will invite great architecture rather than protests. 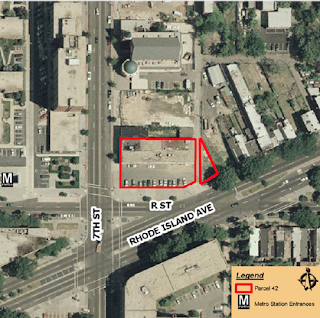 Parcel 42, the catchy name given to the site at Rhode Island and 7th St., NW, across from the new Shaw library and planned affordable housing project, has been vacant for over a decade, but was awarded as a development parcel back in 2007. Economic necessity lead to scaling back the project, with all the design of a county college dorm, from 94 units to 52 units, and to a higher income bar to applicants. That, in turn, caused a sit-in and tent city to pop up in 2010, with protesters demanding lower income levels in a zone dominated by low-income housing. But those plans also failed too, and the site remains vacant. But city leaders have finally issued a new Request for Proposals, now with a new vision. Rather than shoot for the lowest income residents, the District government is again encouraging a maxed out building and - a first - decent architecture. Current zoning allows a 65 foot building with 4.2 FAR, but the District and local ANC are encouraging a zoning change that allows a 90 foot building with 6.0 FAR, a ground floor dominated by retail, and now an 80% AMI designation rather than the lowest subsidized housing designation. The proposal also states a preference for additional affordable units, a "high quality" public space component, and "high quality architecture" with a "signature design." To subsidize the project, the District is providing the land, leaving developers to come up with the right building plan. Alex Padro, ANC Commissioner for the area, notes that specifications were left deliberately vague in order to allow developers the greatest flexibility. "In order to get the creative juices flowing, we worked with the Deputy Mayor to make sure there weren't exact minimums." We need "outstanding architecture" noted Padro. "Its gotta be a building that works financially, that activates the street, we already have a significant pocket of affordable housing in the area." But most of all, said Padro, the building needs to meet high architectural standards like the Shaw library. Developers, however, will be incentivized to compete on the affordable housing provision to get the nod from the city, and the quality of the architecture is likely not going to be something the community agrees upon. Proposals are due by July 26. New buildings in Shaw need to be at least 60% market rate. I understand this isn’t a housing project, but if there is one area of the city where this is too great a concentration of low income housing it is this area. Shaw is easily the biggest missed opportunity in the city. Excellent transit and natural extension of Downtown to the south, Logan to the west and U Street to the North. And yet it is littered with empty buildings, underutilized lots, and vacant commercial strips. No reason in the world 7th/GA shouldn't be as vibrant as 14th. I totally agree with Anonymous @9:59. But the "long-time residents" of Shaw would prefer the status quo over the "G-word." At least 60%? I'd say at least 90% market rate housing...that block already has two low income housing complexes right on top of the metro at R and 8th...with more planned by Lincoln-Westmoreland on top of their car park. I have no doubt there is a need for more affordable housing in DC, but no one can point to Shaw and say it doesn't already have its fair share. Especially at 7th and R. Enough. Kudos to Alex Padro and the ANC for valuing architecture! And for realizing that the only way to have both architecture and affordable housing is to allow the site to be built more densely. This strategy, however, only works if the site is priced for the current, lower density, such that the additional profit from building more can be allocated to the creation of affordable units. In an in-demand location, "affordable" equals "subsidized," and that money has to come from somewhere. Changing the affordable housing designation to an 80% AMI designation means that the income limit for the “affordable” units for a one-person household will be $60,200, rather than $22,575 to $45,150 for one person with the former 30-60% AMI designation. The income limit for a two-person household has been increased to $68,800, rather than $25,800 to $51,600. For a four-person household, the income limit would be $86,000. Median household income in DC (2006-2010) was $58,526, so the residents of this “affordable” housing will have a household income significantly higher than more than half the households in DC. worth noting for accuracy that Alex Padro is not the ANC commissioner representing this property - that would be Kevin Chapple. Padro is the chair of the larger commission of which Chapple is a member.